- PÉre Naidenoff - The Voice of the Heart of Pauline! The Match That Lit the Fire. An Inferno Which Would Cover the Face of the Earth! It was Pauline Marie Jaricot pronounced (Jeri-coe) who lit the match. This true daughter of the Church is worthy of new legitimate praise. Her vision has been shown to be truly prophetic. The source of this flame was her profound interior life, completely open to the love of God, characterized by a child-like spirit. It was this almost mystical generosity which allowed her to find and to enact, without delay, concrete and courageous actions. It is true that, Pauline, like so many others within the Church who have responded whole-heartedly to an exceptional vocation, did not hesitate to shock and even provoke her fellow Christians, particularly those who surrounded her. Those fellow Christians who did not agree with Pauline, did not hesitate to voice their disapproval in ways often, harsh, unjust and even violent. The genius and holiness of Pauline matured and crystallized into a reality of extreme simplicity- the Living Rosary. St. Philomena has guided this association since its inception in 1826 and continues to bless the heroic efforts of its faithful soldiers. And, just as Pauline Jaricot was solely responsible for bringing about St. Philomena’s elevation to the Holy Altar, it is believed that St. Philomena will be instrumental in bringing the cause of the beloved foundress of the Living Rosary Association to the Holy Altar. Prayerfully consider adding your name to the universal petition for the timely beatification of our foundress. My hope is in Jesus Christ! My only Treasure is the Cross! Which surpasses all Thy works! – Was the lifetime prayer of this holy foundress. Let us make this our prayer. In this modern age of freedom and godlessness, with the 'spirit' of the world sowing corruption within family and Church, let us pray all the more fervently for the preservation of the One, Holy, Catholic and Apostolic Church. The universal success of the work of Pauline is to be found in the furnace of charity within her great heart. No matter how great the persecution or injustice she suffered, never was she heard to complain. Pauline was altogether consumed by a great love of God. Before her death she had a very close friend gather up all the letters she had received throughout the years from priests, prelates and hierarchy which contained any compliment or flattery and commanded that they be burned. The letters that were left for others to see would be the ones which had criticism and condemnation. The following prayer was found on her person after her death. It dates from 1856. "My hope is in Jesus, my only treasure is the Cross...I will bless the Lord at all times and His praise shall be always in my mouth. I adore the will of my God. What does it matter to me' O beloved and loveable will of God, if you take from me all earthly goods, reputation, honor, health, and life; what does it matter that you make me descend into the depth of humiliations. What does it matter - if, I find the hidden fire of Thy heavenly love? How happy I should be if I could die for Thee and for my fellow creatures. Jesus, Priest and Victim, I unite the sacrifice of my life and the cross I carry to Thy blood shed for me. I shelter myself in Thy wounds and I expect all strength from Thee. My heart is ready, O Lord, my heart is ready. I only wish to do all for Thy greater glory. I rely upon Thy strength when the supreme moment comes and not upon my own. I have put my hopes in Thy mercy. I recommend to Thee all to whom I may die indebted, and I beg Thee, that having given my life and my blood for them, my friends will pay my debts after my death". Mary, O my Mother, I am Thine! What does it matter except that Christ be made known! The father of Pauline, Antoine, was the thirteenth child of fourteen. He was firm, courageous, honest and pious. It was his custom to attend daily Mass at 4 a.m. before beginning his day's work. He was apprenticed in the folding and selling of silk. After marriage to Jean, harmony reigned in their home. This couple was young, strong, honest and pious. Eight children were born to them. Pauline was the youngest, being born on July 21, 1799. The Jaricot's were very prosperous in their silk business and as a result learned to distrust money and its deadly effects on the soul. At the time of Pauline's birth the clergy had taken a vow of obedience to the State, so that the Jaricot's had Pauline baptized at home by a refractory priest. Pauline's brother, Phileas, was then two years old. These two were inseparable As they grew, they dreamed of being great missionaries. Pauline had a temper and myopia, a condition of near sightedness. She would often run into things. She had a lovely voice and her father called her, "my nightingale," to which her mother added. "of Paradise." She had a happy and spoiled childhood. Entering her teens, she embarked in the 'dashing' social life of the silk world. She says, "I dressed myself in all my finery, believing myself worthy of universal admiration and preening myself with the conceit of a peacock. Self-love made itself forcefully into my heart." At this time in her life she climbed on a high foot-stool and had a severe fall, with a hard knock on the head which affected her nervous system. The doctor feared for her life. Overwhelmed with grief, Pauline's mother offered her own life for that of her daughter. God answered her prayers. She died but Pauline was completely cured. Entering her teens, she embarked in the 'dashing' social life of the silk world. Her heart and soul were torn apart. "My life is dull and my youth is so sad". At seventeen years of age she attended a sermon by the Abbey Wurtz. The subject was of all things, vanity! She was deeply impressed and made her confession to the Abbey. She then went home and burned her romantic novels and songs, set aside her jewels and decided never again to look into a mirror or wear beautiful dresses. "I suffered terribly during my first few months of conversion. I would never have been able to cure myself of vanity if I had not guarded myself carefully. Her soul was resolved to serve the Lord. Pauline turned the page of her life by making a general confession. A short while after, she visited a Marian Shrine and made a vow to remain chaste in body and soul though clearly understanding that she did not have a religious vocation. Two passions dominated her and remained with her throughout all her life; anger and pride. The first caused her to feel fury. "In order to keep silence, I had to put in my mouth whatever was close at hand. My passions weakened to the degree I combated them." At a large family gathering, she begged forgiveness for the worldly inclinations she had so often shown. Many tears were shed on that day when young Pauline closed the book on her past. She felt liberated and renewed. She began to take upon herself works of charity. She visited the poor and dressed like one of them. They were never made to feel indebted, but she gave them, rather, the feeling that it was her honor to be with them. She helped the desolate and waywardly girls of her own age, obtaining for them work in her brother's silk factory while encouraging piety and good works among them. Pauline, remembering the spiritual decay caused by the Revolution and above all the permanent offense given to God, gave her group the explicit name of women of reparation or 'Reparatrices.' They made reparation which was to penetrate devotion to the Blessed Sacrament and the cult of the Sacred Heart in France. She abandoned herself to the Heart and love of Jesus and gave the Church one of the greatest imaginable works. Christ spoke to her innermost soul and put her, without her realizing it, on the mystical path which is told in the story of her life. She abandoned herself to the Heart and Love of Jesus and gave the Church one of the greatest imaginable works. In her own words, she modestly said, "I lit the match that lit the fire." It was an inferno that was to cover the entire surface of the earth! The founding of the Propagation of the Faith was no accident, but rather an entire chain in her life. It was through her correspondence with her brother Phileas that the Society was born. She encouraged her brother to the priesthood. And together they had great concern for the foreign missions. Phileas asked for her help with the Society of Rue de Bac, a propagation of the Faith which had formed in Rome in 1692. The work was two fold, prayer and alms to spread the Faith in the countries of Asia. 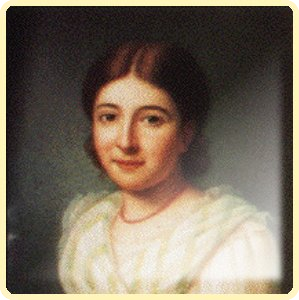 On May 3, 1822, Pauline Marie Jaricot founded the Association in Lyon. The Association for the Propagation of the Faith had as its sole aim the raising of funds for the Asian missions. In the Spring of 1818, with her heart set afire Pauline began work among the 200 'repartees' at the factory. The donation suggested was a "sou" which at that time was l/2Oth of a Franc (penny). Pauline could have put out a collection box, but she preferred the idea of a 'collector.' Pauline always wanted to personalize an action. She went from person to person. This is the major characteristic of her life, as well as the profound explanation of the extraordinary success of the works that she began. Pauline always wanted to personalize an action. She went from person to person. She prayed to God for a plan and the idea of groups of 10's 100's and 1000's came to her. Each group leader was responsible to the leader of the group above. The plan succeeded beyond her wildest hopes. The first month she did everything herself. Pauline, alone, bore the questions, reluctance and oppositions. The Vicar, Abbey Quelque, launched a campaign against her. In a sermon, he accused her of beginning a 'non-authorized work' in Lyon. The same thing happened in other parishes. A few supported her, but quietly. She begged their pardon and said that she would disband the organization without delay. Her instructions were not to disband, but not to expand! The pastor of St. Polycarp took up her defense. She was then 19 years of age. Phileas encouraged her to continue. His words to her in a letter were prophetic, "Continue to propagate this work of charity. It is, possibly, the mustard seed that will produce an enormous tree, whose benevolent branches will overshadow the entire surface of the earth." It is, possibly, the mustard seed that will produce an enormous tree, whose benevolent branches will overshadow the entire surface of the earth. A French Bishop from the U.S. was sent as an embassy to Lyon for the purpose of collecting money for a diocese in New Orleans. American Missions needed help. He suggested that a charity be designed to encompass both worlds: Asia and America. He perceived Pauline's genius and used it. When the plan was shared with him, he acted as though he thought of it himself. Abbey Inglese proved to be a swindler and a thief. He embezzled large sums of money for his personal use. He became a member of the Association of Lyon, won the others over by the weight of his title, his eloquence and his ardor. Everyone applauded him and asked him to found such an association. Someone presented him with the system which was already set up. Nothing was changed. The leaders remained the same, the same decimal system was used and the members themselves were the same. THE INVISIBLE FOUNDRESS WAS THERE. May 1822 was a happy time. There was no vision of the problems that would arise 25 years later. These men were drowned with the eloquence of Abbey Inglese and his "spontaneous explosion of common thought." The Secretary recorded this statement, "We have done nothing but to develop and regulate an idea that WAS NOT originally ours." Pauline gave to this group of 12 the ability to continue and develop her association; by plan of action that was adopted, by leaders who met in council and by the troops, which it inherited. Pauline was, at the time, a far distance from Lyon, sick. She learned what had happened and reflected on it. 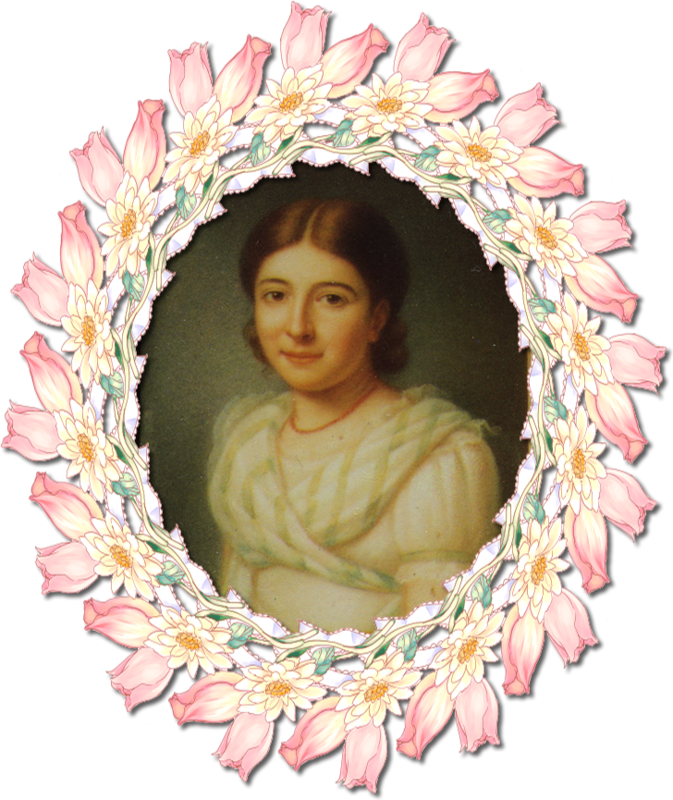 She was delighted with the fact that God had found other instruments to make the Propagation of the Faith work, but she did not wish for her small, efficient collecting groups to be absorbed into this new organization, which was still so uncertain. After having it explained to her, she understood the Association consisted of applying the plan that she conceived, to a 'charitable work destined to bring the Light of the Faith to the two worlds.' This was her hoped for goal. Acting with realism she suggested that the collections be divided; one part for the American Missions and the other for the Asian Missions. This was acceptable to all and they were delighted with her wisdom. At 22 years of age, Pauline stayed in the shadows and contented herself with managing her group of 100. It was at this time that she retired and wrote, a treatise entitled: Infinite Love of the Devine Eucharist This was published under an anonymous name. Abbey Wurtz thought it so excellent; he felt she had a vocation to the contemplative life. Pauline suffered intensely, but obeyed her confessor with the entirety of her whole being. Time passed. The Propagation of the Faith expanded without Pauline who disappeared into obscurity. It continued without deviation from the great plan; the great contribution of Pauline Jaricot! Such a woman is Pauline, who is held sacred in the Church on more than one account. Pauline's genius matured through even greater reflections. These were to be crystallized into a reality of extreme simplicity. The Living Rosary. It is to her we owe the wonderful thought of distributing amongst fifteen persons, the fifteen decades of the Rosary. In this manner she found a marvelous way to propagate devotion to the Mother of God and to unceasingly invoke her aid. Many Pontifical letters recommended and enriched with numerous indulgences, this new form of prayer which so rapidly spread through public acclamation. The Rosary is not a devotion to the Blessed Virgin, it is THE devotion to Mary! As closely as we can ascertain, Pauline very likely began this devotion within several parishes on December 8th, 1826. The beautiful devotion of the Rosary had long been left to those who called themselves 'devoted' and to the aged and sick who could do nothing else. The two-fold purpose for the creation of this Association was to save France and encourage souls to learn their faith by distributing good Catholic books. Pauline knew the enormous power of the Rosary against the forces of evil. Some objected that the repetition of the Rosary was childish and the other forms of prayer would have greater merit. To which Pauline replied, "Suppose you had been on earth when the Holy Family were living and you knew they were partial to a certain kind of flower. Wouldn't you try to get it for Them, even though you yourself preferred another!" Let us learn to appreciate the value of the Rosary which the Blessed Virgin recommends to us so strongly. Pauline knew the enormous power of the Rosary against the forces of evil. Pauline had the ingenious idea of making each group of 15 to consist of "the good, the mediocre and those individuals who had only good will -15 coals: one being well lighted, 3 or 4 partially so and the others not at all. Bring them all together and you have a furnace!" Father Ramiere to whom we owe the great work of the 'Apostleship of Prayer' wrote in 1862, "This admirable association makes it perfectly suited to become an instrument of zeal. The soul chosen by God to found the Propagation of the Faith, Miss Pauline Jaricot, is welcomed heartily by the Apostleship of Prayer." Each member volunteered to donate a sum of five francs a year, and to bring five other members into the Living Rosary. Most all of the bishops, either by a note or long letter, had recommended The Living Rosary as an essential association for their diocese. After the death of Pauline the members numbered in excess of 2,250,000 in France alone. Pauline herself said, "We will be united in prayer with all rosaries of the universe, " -- a universal Living Rosary! After the death of Pauline the members numbered in excess of 2,250,000 in France alone. Pauline animated this immense association with newsletters in which she knew how to suggest her ideas in an admirable fashion: "Lift up your hearts! Let us not concern ourselves with small personal interests; let us not waste our tears on things of small import; let us embrace the universe in the vows that we have formed. Jesus died for all men! Why weaken our hearts with less noble desires?" Pauline, faithful to her youth, brought the members into full missionary work. Initially the gentlemen of the Central Council of The Propagation of the Faith attempted to suppress The Living Rosary for fear that it's success would be harmful to their collections. After speaking with Pauline on several occasions, they gave it their wholehearted support. Pauline loved to write. She wrote quite a lot and she wrote quite well, whether the subject was a rapturous flight of the soul, or a lengthy correction of self. She inflamed the 2 million members of the Association with her profound, ardent and practical newsletters, which caused a chaplain to write, "They are for our meetings what the Epistles of Saint Paul were to the first Christians." In 1835 , before and then after her miraculous cure of a grave heart condition at the shrine of St. Philomena, Pauline was a glorious celebrity. She moved to a new location at Lorette from which she directed the immense Living Rosary and handled her personal fortune. This management can be seen as a stunning testimony of her knowledge, her practical spirit and the sureness of her judgment. The fact of her eventual financial misfortune can be seen as to have come from a higher source. In her darkest hours Cardinal Vallecourt wrote, "The present position of this true daughter of the Church is a problem which cannot be resolved. In all aspects, there is something so extraordinary, that one cannot help but believe it to be the great trial of predestination." At the height of her happiness, Jean Marie Vianny sent to Pauline a young woman who was to remain at her side to her death. This gesture proved that the CurÉ of Ars knew perfectly well the spiritual personality of Pauline Jaricot. He told Maria, "I will give you a mother who will know how to make you advance in the love of Jesus Christ." And to Pauline this note, "I am sending you a soul, which the Good Lord has surely made for Himself and for you. The Holy Virgin has preserved her up to now from all evil; therefore, guard her well in your turn and teach her to love even more Jesus and Mary." A friend of the Jaricot family, Father Magallon, visited Pauline and to show his appreciation for the generosity he had received at the family's hands, he gave her a most unusual gift. In fact, it was beyond price, being a major relic of Philomena and the only one of it's kind in France. "Let us pray for Philomena's canonization," Pauline suggested. "If we do, I am sure she will bless our work in many ways." Pauline Jaricot suffered from advanced heart disease which increased with time until her closest friends recognized that death was imminent. In March of 1835, this illness had seriously affected her heart, and in proportion as it increased, the palpitations became so violent that they could be heard at a distance and caused her unmistakable agony. 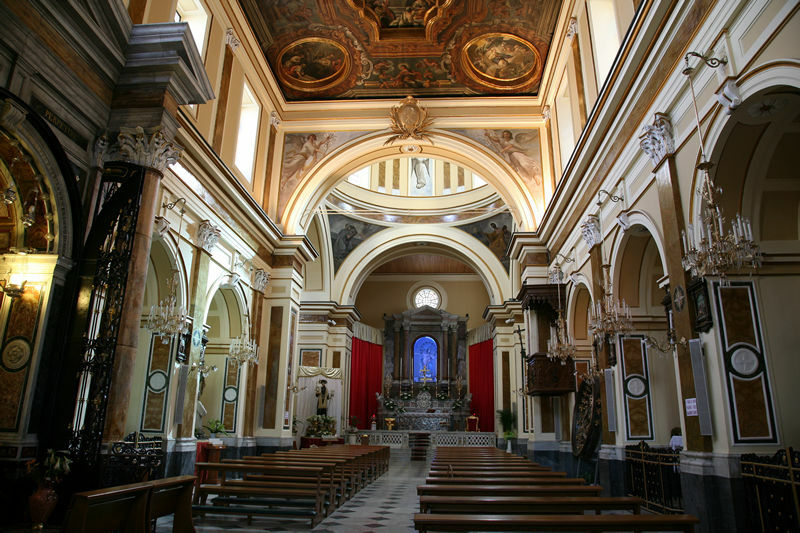 At this time Pauline decided to travel to Rome to seek an audience with the Pope and to get the Holy Father's blessing (the ambition of her life) then on to Mugnano, where the relics of St. Philomena were enshrined, in hope of a cure. The Shrine in Mugnano where Pauline's Great Miracle took Place. A journey to Rome meant traveling by coach over the Alps, through wild and abandoned stretches of country, a long dangerous journey even for those in a normal state of health. But Pauline set out. Her arrival in Rome was reported to the Holy Father, Pope Gregory XVI, who, being informed of her state, resolved to go in person to this young woman who had done so much for Holy Church. This was truly an extraordinary honor, and likewise an unspeakable consolation to Pauline. The Holy Father was most kind and gracious. He thanked her repeatedly for her work in behalf of the Catholic Church, and blessed her over and over. He asked her to pray for him when she got to heaven, and Pauline promised. Then she asked: "Holy Father, if I come back well from my visit to Mugnano, and go on foot to the Vatican, will your holiness deign to proceed without delay with the final inquiry into the Cause of Saint Philomena?" "Yes, yes, my daughter," replied the Pope, "for that would be a miracle of the first class." Turning then to the superior of the Sacred Heart nuns, the Holy Father continued in Italian: "How ill our daughter is! She seems to me as if she had come forth from the grave. We shall never see her again. She will never return." Pauline understood, but only smiled confidently. The Pope blessed her anew before taking his departure, and turning to Cardinal Lambruschini, who had accompanied him, bade him pray for her and grant her all the indulgences possible. By now it was August and exceedingly hot. The party set out for Mugnano, traveling by night to avoid the great heat of the day. They arrived at Mugnano on the eve of the feast of Saint Philomena. Vast crowds had assembled to celebrate the feast. When they learned who Pauline was and what was her purpose in coming, they were greatly excited. The next morning, the feast of Saint Philomena, Pauline received Holy Communion near the shrine of the saint's relics. She suffered frightful pains all through her body, and her heart beat so violently that she fainted. The crowds thought that death had taken her, and so loud was their outcry that those who were with Pauline attempted to take up the special chair on which she was lying and carry it out of the church. But she recovered consciousness enough to make a sign to leave her near the relics. Suddenly a flood of hot tears burst from her eyes, color came back to her cheeks, a healthy glow spread over her benumbed limbs. Her soul was filled with celestial joy, and she thought she was about to leave this earth for heaven. But it was not death. Saint Philomena had cured her! She was still to live many years to toil for God and His Church. 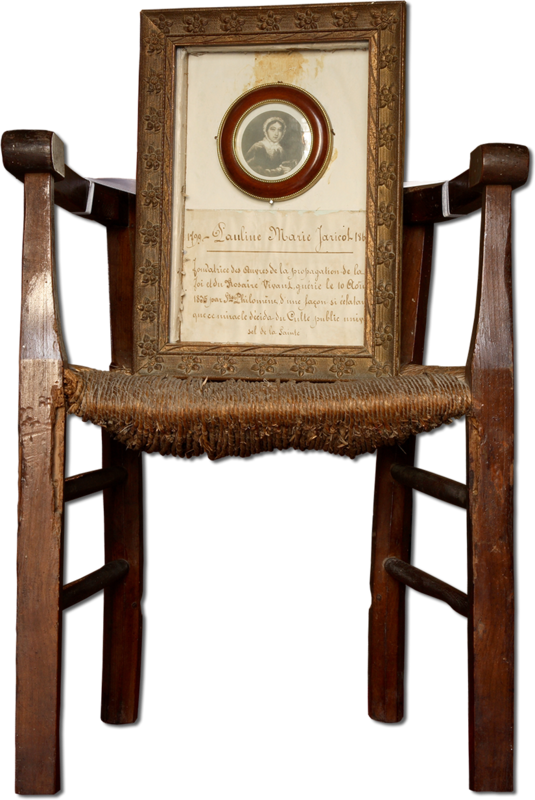 The Very Chair in which Pauline Sat which is still at the shrine today. Pauline, when certain of her cure, remained silent for a short while lest the enthusiasm of the crowd be too vociferous. But the Superior of the convent, surmising the truth, ordered all the bells to peal in announcement of the miracle. The Rosary were frantic with joy, and shouted over and over; "Long live Saint Philomena! Long live our dear saint! Long live the good French lady!" Pauline lingered for some days at the shrine in thanksgiving and when at length she departed, she took with her a large relic of Saint Philomena, encased in a life-sized statue of the saint. This was clothed in royal robes and given the place of honor in the carriage. As Pauline made her way back to Rome, large crowds gathered at the various stopping places and shouted: "A miracle! A miracle!" Pauline had not informed the Holy Father of her cure, the more to enjoy his surprise when she should present herself before him. All in the Vatican who had heard of her were astounded on learning of her cure. The Pope, above all, was struck with amazement on seeing her before him in perfect health. His Holiness would not have believed the reality, had he not seen her with his own eyes. 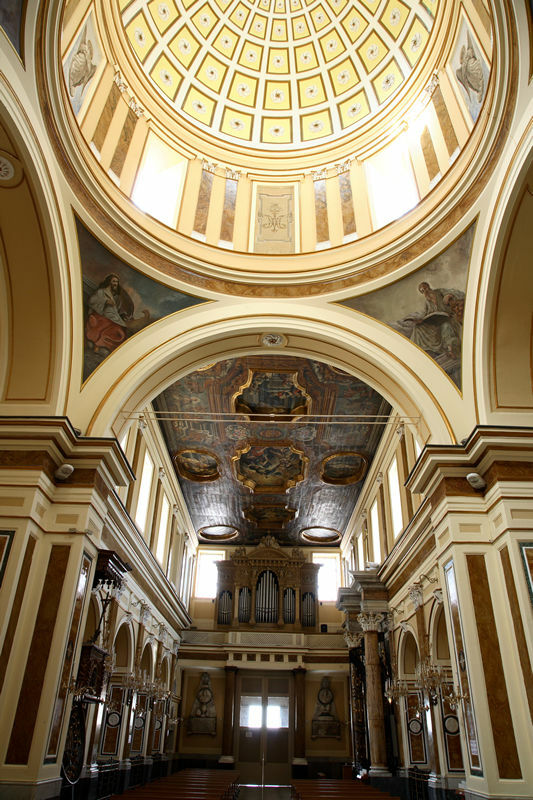 At her request he granted the privilege of building a chapel in honor of Saint Philomena. In order to investigate the miracle thoroughly, the Pope commanded Pauline to remain in Rome for one full year. During this time Pauline obtained from the Holy Father many privileges for the Living Rosary. At the end of the year, Pauline returned with his blessing to Fourvieres, France. The Association of The Living Rosary was prospering most remarkably and in the summer of 1838 Pauline was able to inform Pope Gregory XVI that more than a million members were now enrolled, each offering one decade of the Rosary every day and contributing from fifteen cents to one dollar in yearly dues. There was an average of 1000 religious items leaving Lorette EVERY DAY. Throughout her life she had given endless large sums of money to every charity. People need only to come to Mademoiselle Jaricot and she gave financial help as well as spiritual encouragement and wise counsel. Money had little value to her in itself, she viewed it in the light of the good it could do. No one was turned away. People need only to come to Mademoiselle Jaricot and she gave financial help as well as spiritual encouragement and wise counsel. Pauline's dream was to help the working class; to establish a community of workers, a model Christian town; where men and women could be paid a living wage, the children would be educated, the sick and the aged cared for. Naturally it would take a great deal of money to finance so great a project. Pauline was careful to seek council concerning this project, not wishing it to be a vain or unholy idea. After explaining it to Abbey Vianney , he remarked, "Child, it's wonderful! Just wonderful! Don't allow anything to keep you from it's accomplishment. Don't worry about money. Remember what we have been able to do at Ars because we trusted in the Heavenly Father." For more than two years Pauline prayed and sought advice on the undertaking. Presently, she had an idea for financing. She would institute a 'Bank of Heaven', an association of 15 wealthy Rosary who would donate $20,000.00 to form the initial capital fund of $350,000.00. This capital was given to a man who was to make the transaction for Pauline. Instead, he stole the money and used it for his own personal needs. Pauline's lawyers said, "You are an innocent victim of fraud." Pauline was reduced to begging in order to raise funds to repay those generous donors who invested in the "Bank of Heaven". She was advised to ask 'pennies' from the Propagation which she had founded, to help absorb the burden of her debts. This she did, only after exhausting every other means of raising the money. She even went begging. The Association obstinately refused to give her recognition as the foundress and thus relieved themselves of any moral obligation to assist her. Pope Pius IX sent them a written note saying that as the foundress of this good work, they should help her. Pauline under obedience, wrote, "--There will never be another foundress of this good work, but she whom the Good Lord deigned to use, without regard for her unworthiness. Yes, good Sirs, I am not merely an associate, but the true foundress of this work. I truly conceived its plan," wrote Pauline. Recognition and financial assistance denied! "An infamous betrayal was to rob her of her fortune. Besides the bitter pain off seeing a work perish that she dearly loved, and all the anguish produced by destruction, this disaster brought upon her head touching and cruel difficulties which resulted by her being assailed by creditors, tribunals, journeys on foot, rebuffs, blame, calumny, and even scorn. In a word, all that is capable of wearing down even the. most valiant of hearts. God permitted this, undoubtedly, so that she who had lived for Him and for the salvation of her brothers, would in her last days, follow Jesus Christ, who died for those who condemned Him. And that by her faith, her confidence, her spiritual vigor, her gentleness, her serene acceptance of all these crosses, she would show herself to be His true Disciple." And this is where the story ends. Destitute and alone, Pauline was refused help from The Propagation of the Faith, who in turn directed even her Living Rosary family to abandon her in her hour of need. In poor health and aged, Pauline walked miles and miles, but there were only refusals. Madalene Sofie Barat, a close friend of Pauline, comforted Marie at this time saying, "In all my seventy years. I have never met anyone to equal your Mother Pauline. Such clarity and resignation! Child I do think we have a real saint living with us." In her sorrow, Pauline again went to visit the saintly Abbey Vianney . His words to her were full of wisdom. "Through the hands of the Blessed Virgin, the Good God frequently grants one of the greatest gifts in heaven's treasury- an understanding of the WAY OF THE CROSS; a love of trials and sufferings. My sister, to try to get from under the cross is to be crushed by it's weight, but to suffer it lovingly is to suffer no longer." Father De Montfort's book, True Devotion to the Blessed Virgin Mary, was a precious manuscript of which Rosary were becoming aware. Pauline was becoming more and more absorbed spiritually in True Devotion. "Mary, my Mother, I am all yours," she was often heard to whisper when she was not aware that she was being overheard. The thought of dying in debt was always her greatest cross. Death was preferable to this. In this state of poverty and apparent failure, Pauline breathed forth her last words in this vale of tears, "Mary, O my Mother, I AM thine." The women at her bedside drew near and their eyes widened in astonishment. In the light of the single oil lamp burning in the sick room, Pauline's face was radiant! "Why, she is beautiful!" they exclaimed! "And how young she looks!" Maria Dubuois smiled, "The saints are always beautiful and young!" Such a woman is Pauline! As we, the children of her Living Rosary, enkindle the fire of this great apostleship of prayer, of which she is the mother and foundress, let us not allow the world to forget to whom they owe an eternal debt. Do not allow history to repeat itself. We have done nothing but to revive The Living Rosary Association of Venerable Pauline Jaricot and enkindle its fire over the face of the entire earth, She, it was, who's coal was the source of our inferno! The members of the Universal Living Rosary Association humbly ask your help in petitioning the Holy See for the beatification of Venerable Pauline Marie Jaricot. We simply ask that you prayerfully consider adding your name to the universal petition for the timely beatification of our foundress. Please click here to download the form that can be printed from your computer, signed and mailed to the address listed. We very much appreciate your prayerful consideration of this effort. For more information about the Living Rosary, please visit the Universal Living Rosary Association web site. "An infamous betrayal was to rob her of her fortune. Besides the bitter pain of seeing a work perish that she dearly loved, and all the anguish produced by destitution, this disaster brought upon her head touching and cruel difficulties which resulted by her being assailed by creditors, tribunals, journeys on foot, rebuffs, blame, calumny, and scorn. In a word, all that is capable of wearing down even the most valiant of hearts. God permitted this, undoubtedly, so that she who had lived for Him and for the salvation of her brothers, would, in her last days, follow Jesus Christ, who died for those who condemned Him. And that by her faith, her confidence, her spiritual vigor, her gentleness, her serene acceptance of all these crosses, she would show herself to be His true Disciple. These writings of her life will show forth her beautiful soul and noble heart and be a spectacle of great virtue. This is what We desire, what We ask God for." We, the undersigned, do hereby request and petition the Holy See, without delay, to recognize the beatification of Venerable Pauline Jaricot -- Great Daughter of the Church, foundress of the Society for the Propagation of the Faith and the Association of the Living Rosary. Heart of Jesus, Who Thyself is the model of all virtue and perfection, deign to hear our supplication and to glorify Thyself in giving glory to Thy servant Pauline-Marie Jaricot. She is the Mother of missionaries and the Living Rosary and spent herself completely in the spreading of the Catholic Faith in all the world. May we obtain through the intercession of Pauline-Marie Jaricot the virtue of humility. We think so little of Thee because we are full of self. Obtain for us the grace to know our nothingness and to rejoice in our dependence upon Thee. Pauline was an example and apostle of humility. Guide us by her example and strengthen us through her intercession to conform our hearts like unto Thy humble and crucified Heart. Renew, O Lord, in these days when pride and forgetfulness of Thee are so widespread, the wonders which Thou didst perform through Thy humble servant, Ven. Pauline-Marie Jaricot, during her lifetime. We pray that soon it will please Thee to perform through her intercession the miracles needed for her Beatification and Canonization. In return for all that she has done to extend Thy Kingdom upon earth, may the world know Venerable Pauline and the surpassing value of her virtue of humility. This WaysideAudio file, about Pauline Marie Jaricot was born in Lyon on July 22nd 1799 to a profoundly religious family of silk merchants. Her entire life was given completely to God and her Holy Mother, the church. From her conversion at the age of 16, she devoted herself to a life of prayer and as a contemplative wrote many great works including The infinite Love of the Divine Eucharist. Had Pauline not been withdrawn from the activity of the world she would never have fully understood the importance and necessity of prayer. However, having given up the world, she dedicated herself to works of charity. She found that to serve the poor and afflicted was to serve Christ himself, thus she rushed to help the unfortunate. Sharing her time between helping others and her life of prayer, she soon realized that to truly help others, she must bring them to God. The French Revolution had wrought havoc and destruction to the missionary effort. The entire attitude of the church towards the mission was undermined. There were no viable initiatives or collections to help the missions. Pauline prayed much on this and had a sudden inspiration, thus The Association of the Propagation of the Faith was born from God, for her to spread across the world. Pauline’s apostolic soul longed to bring the knowledge and love of Christ to the whole world. Never did she cease to sing the glory of God and give him thanks. She says Receive us in thy embrace as we are, and give us all that thou hath, so that disappearing in thee, an ocean of love and perfections, nothing will remain of us any longer but thyself wherein we are hidden.